Crusading publisher Austin Spenser (Sidney Blackmer) wants to prove a point about the insufficiency of circumstantial evidence. Spencer talks his prospective son-in-law Tom Garrett (Dana Andrews) into participating in a hoax, the better to expose the alleged ineptitude of conviction-happy DA (Philip Bourneuf). Tom will plant clues indicating that he is the murderer of a nightclub dancer, then stand trial for murder; just as the jury reaches its inevitable guilty verdict, Spencer will step forth to reveal the set-up and humiliate the DA. Somewhat surprisingly, Tom eagerly agrees to this subterfuge. Unfortunately, an unforeseen event renders their perfectly formed scheme useless. 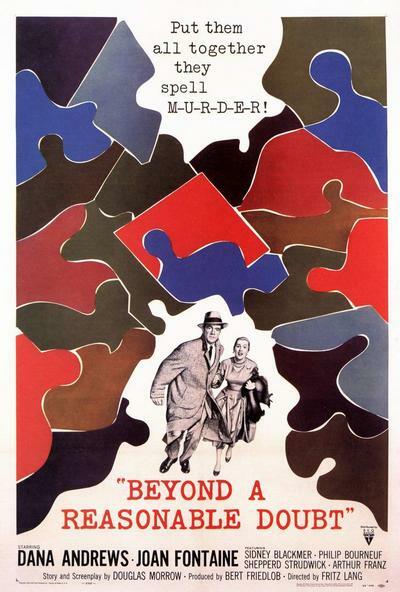 Beyond a Reasonable Doubt was the last American film of director Fritz Lang.